With thanks to Brenda Whitaker (nee Grime) for the scans and comments. Thanks also to Alan Pickles, Howard Barrett and his wife Christine (nee Hardaker) for additional names, and Rita Chadwick (nee Overend) for additional scans. The Sutton Baptist choir was like many others in the district, if we were performing a particular work - like The Messiah, or other similar works then the call would go out to the neighbouring churches and chapels in the district for help with certain voices - be it tenor or alto or whatever. The local choirs would then boost the performing choir with their members so that the performance was properly balanced. Similarly Sutton Baptist would reciprocate and this meant we sang at a varied number of chapels in the district. It was always a very special time, even for the young teenagers like myself. We met, sang and worshipped with the other villagers in the area. Cross Hills, Glusburn and Connonley and Steeton being the most visited. 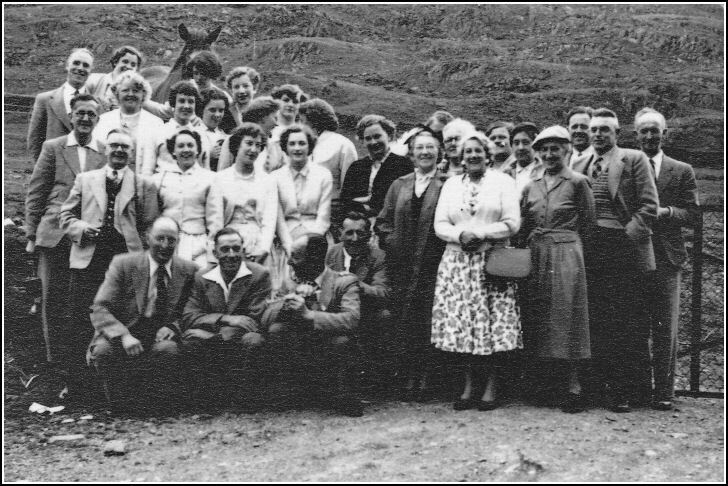 Front row: Dorothy Midgley, Mary-Ann Overend, Annie Hardaker. The handbag is probably significant in that I believe she had just been presented with it as a long-service award. The back of this photo shows it was taken by the Keighley News but I cannot recollect what the occasion was. Does anyone else know? 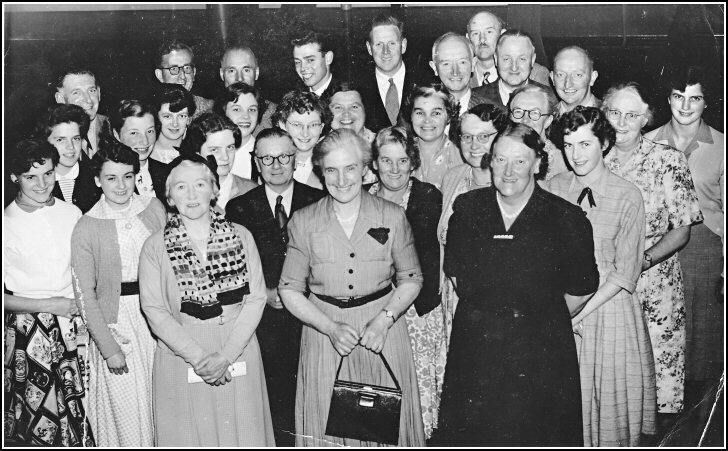 We did enter the local Eisteddfod a few times at the Keighley Town Hall so maybe it was something to do with that, or.... was it specifically to do with the lady in the centre of the photo, whose name I just can't remember. The following photos are from a couple of trips we took as a choir group. We went on many trips and always 'sang for our supper' with a suitable "Grace" in every restaurant or caf� we ate. 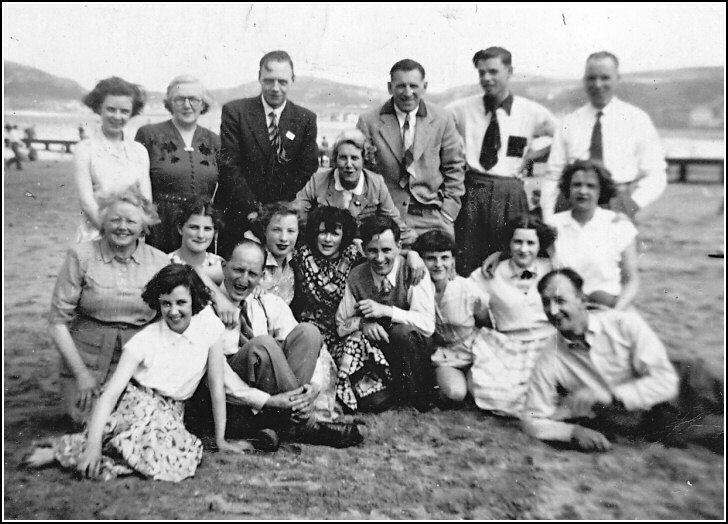 By the time we reached home again in the evening we could be quite hoarse as we sang virtually the whole time; hymns, modern songs and mostly the old favourites amongst which was always "Just a Song at Twilight". 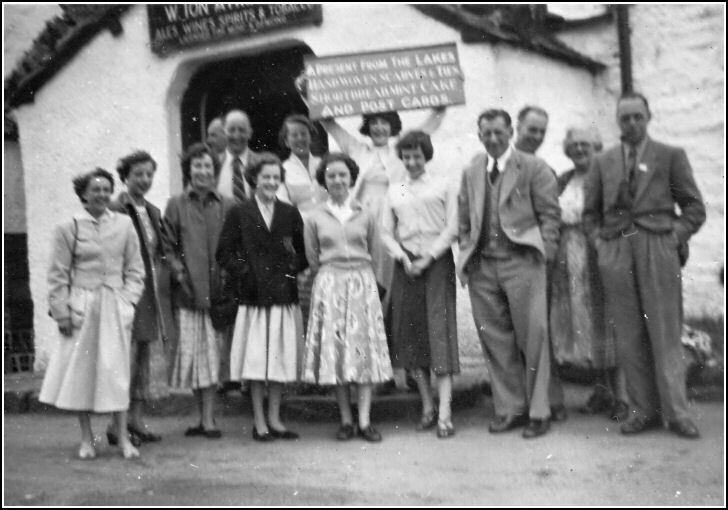 As I, amongst others on the photos, were the youngsters on these outings it proved to be our grounding for all the old favourite and wartime songs which were well known by everyone on the coach. I don't think we, the young people, appreciated the kindnesses and tolerance shown by the �oldies� as they were such wonderful people and I am so sorry I can't remember all the names. If anyone can fill in the gaps it would be wonderful. The date on one of these is 25 June 1955. Maybe some other Sutton in Craven web browser like me will recognise the photo and/or the place. I would guess it is somewhere in the Lakes! Joan Barrett is holding up the sign, so maybe she can remember. Front row: Audrey Driver, Joan Hargreaves, ? ?, Rita Overend, Barbara Dawson, ? ?, Frank Barrett, Oswald Brierley. 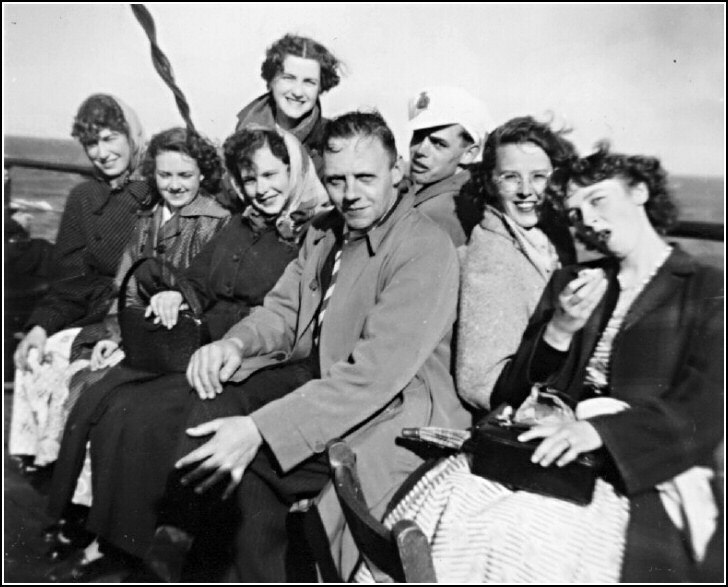 4th row: Howard Barrett, Betty Monkhouse, horse, Joan Barrett, Joan Hargreaves, Brenda Grime. Edith Robertson ? ? (peeping through), Mary-Anne Overend, Ronnie Smith, Dan Robertson, Leonard Barrett. 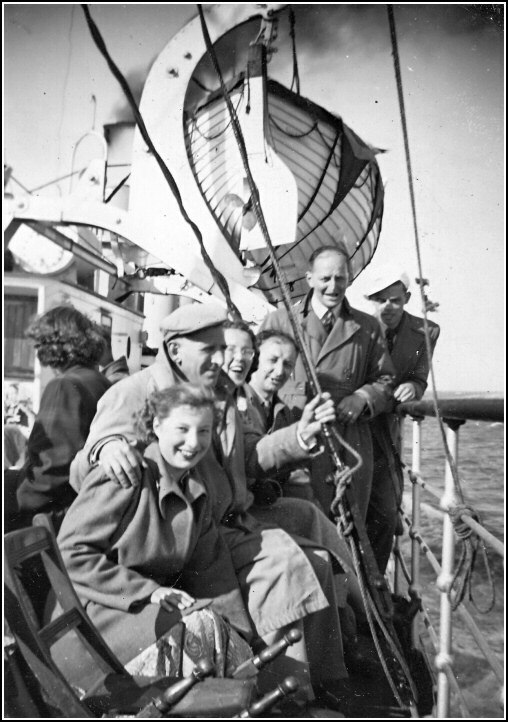 In 1954 we went to Llandudno by ferry from Liverpool. In this respect this was possibly the most adventurous of the trips in my era as my recollection is that it was more likely to be the Lakes District or one of the more accessible seaside places like Blackpool! 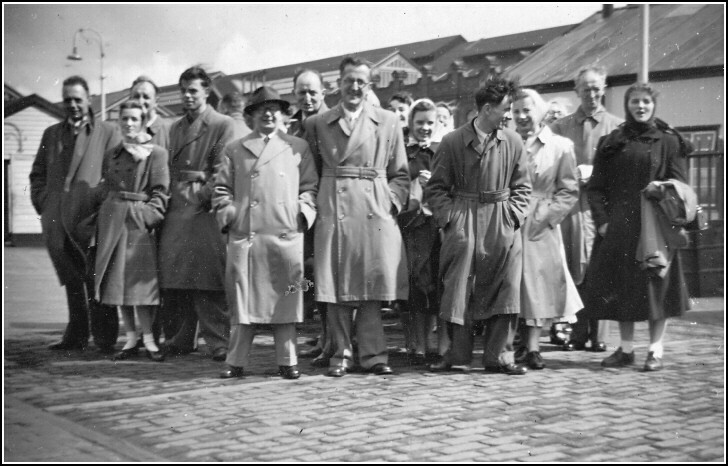 The first snapshot is of part of the group huddled on Liverpool docks waiting for the ferry to Llandudno. It started out as a bitterly cold day and I am remember the ferry trip was windy and rough, making for some 'unwell' passengers. The next is on the ferry when obviously it had calmed a little, and the last photo shows many of the group on the sands at Llandudno so the sun must have shone. 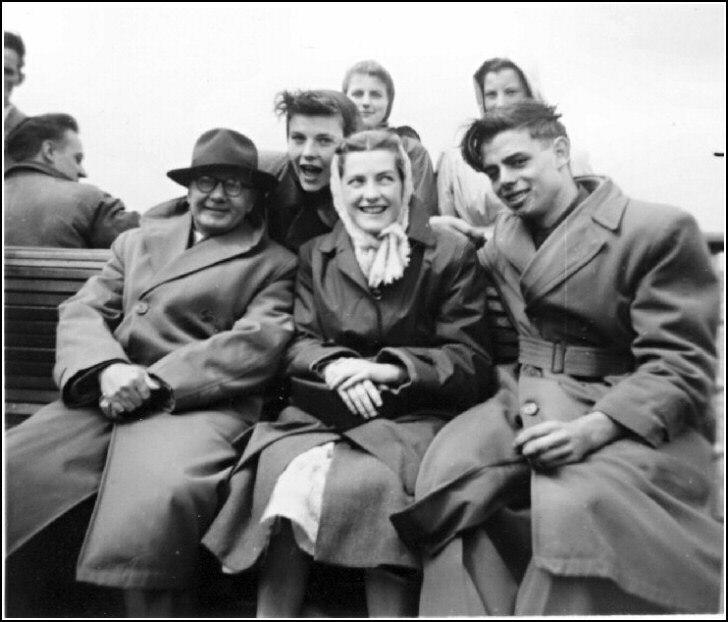 From the front: Joan Hargreaves, Frank Barrett, Ruth Midgley, the Barrett brothers and Jim Monkhouse. Front row: ? ?, George Barrett is cross-legged and brother Brian Barrett lying down. "It is a very vivid memory for me, an adventure into the unknown... Wales, Liverpool and a trip on a boat! I can remember being one of the very few who had the meal on the boat. Some returned home by train, missing a calm trip back to Liverpool. I think someone lost their teeth? As we stood up to sing in the chapel the next day I still had the feeling of the movement of the boat. Happy days."